What you would have picked, the glittering T20 tournament or a Cricketing Board which is sabotaging your skills as well as your reputation? At times we experience the tough, the mean, the unfair life. But if we show the determination, we show the will it’s not that hopeless to turn it around. For a second, assume that you are an International Cricketer. You haven’t been doing very well lately and you are dropped from the National T20 side. You are wondering about the game which has given you so much, that it is impossible to think about T20 and not discuss your performances. The franchise which gave you a lucrative contract last year; is not retaining you. It seems as if no franchise has the confidence in you and your performance. As you make your way through these dark hours, your cricketing board puts more pressure back on you by opting you to play in the ODI series. So, for playing for the National ODI team, you have to sacrifice the glittering T20 contest. Also, you have to abandon the franchise which gave you a chance and believed in your skillset in spite of your poor performance in the last year. It’s very subjective question and I will not provide any reasons/facts supporting one. However, Chris was trying to find the correct answer. He opted to back the Royal Challengers Bangalore which believed in his skills. The very first match he played against the Kolkata Knight Riders, his previous team and scored 102 of 55 balls. After three days later scored another century and was nominated as Man of the Tournament scoring maximum number of runs in that IPL Season. The next season, He scored 175 of 65 balls against Pune Warriors India and that was the last season we saw Pune Warriors India in the IPL. Chris Gayle of the Royal Challengers Bangalore pulls a delivery for six during match 40 of the Pepsi IPL 2015 (Indian Premier League) between The Royal Challengers Bangalore and The Kings XI Punjab held at the M. Chinnaswamy Stadium in Bengaluru, India on the 6th May 2015. 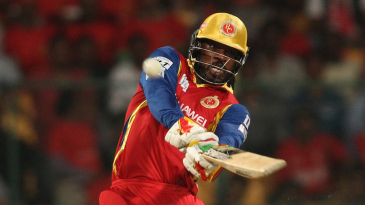 May 6, 2015 Chris Gayle vandalized the Kings XI Punjab Bowlers by scoring 117 out of 57 balls. It will always be a disaster if you keep dropping the catches. Kings Xi Punjab didn’t miss the catches, but they showed a lot of consistency in keep dropping the catches. If you drop a catch of a below par player, you still have a chance to compensate for that err. But if you drop Chris Gayle twice in a inning, It’s hard to contemplate what you have done. Gayle went on to hit seven fours and twelve sixes; which brought Kings XI Punjab bowlers to look like club bowlers when the carnage was on the full throttle. Once KXIP started chasing the 226, Mitchell Starc and Aravind sent the half of KXIP batsmen back to pavilion before the power play was over. Seven batsmen were bowled; which can probably explain the sheer pressure which was put on the KXIP batting line up. All in all it was Chris Gayle who swept through all the post-match presentations on trophies. It was his fifth man of the match in the IPL this year.